Oktoberfest isn’t just a beer drinking festival. The annual German event actually celebrates the harvest, yet Oktoberfest food is often overlooked for all the steins of beer. But hey you need some food to wash that beer down with, right? Oktoberfest is one of the most popular harvest celebrations around the world. But it isn’t just an event in Germany. Of course, in Germany millions of locals and tourists enjoy the festival. But it’s also popular in other parts of the world with large settlements of Germans, such as Kitchener in Canada, Cincinnati in the United States and Blumenau in Brazil. Oktoberfest is huge in these cities, with halls specifically built to use once a year for Oktoberfest. In Kitchener people book tickets up to a year in advance so they get the best party. Years ago I went to the Oktoberfest party in Kitchener, it’s not the same as Germany but it’s definitely a good time. 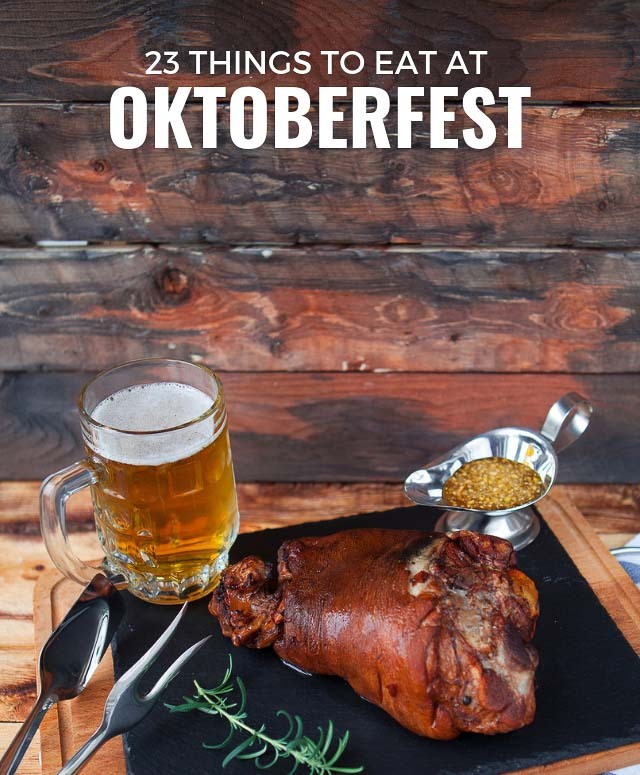 Along with the ridiculous amount of beer that is drunk during the festival, there are also some iconic foods that really are found in all Oktoberfest events, and others that are worth seeking out if you would like the authentic Oktoberfest experience! 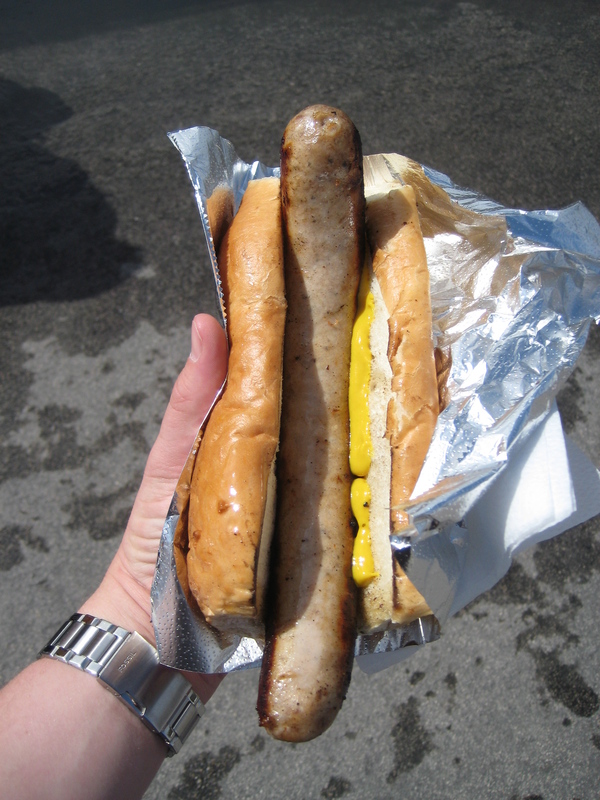 Oktoberfest Sausage – It’s the Wurst! 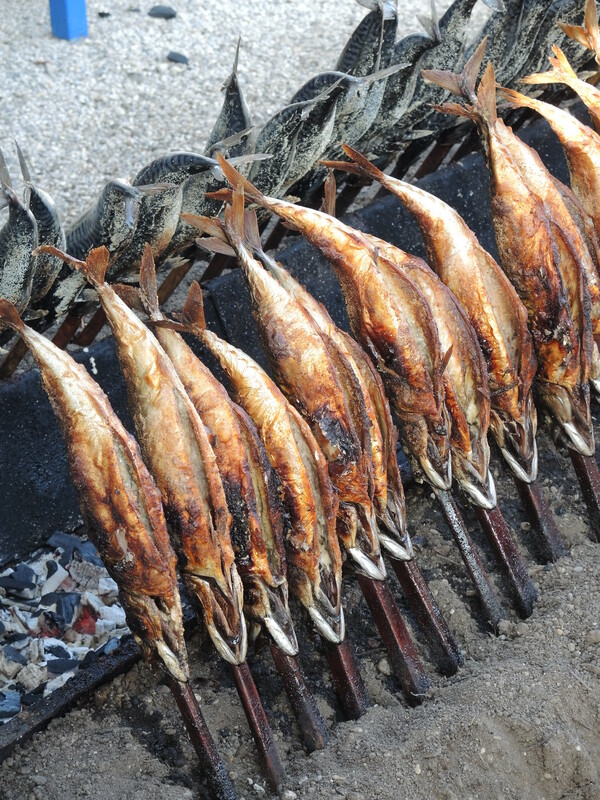 Literally translated, ‘stick fish’ is exactly that, a fish which has been skewered on a stick. It is marinated in garlic, oil and spices before being grilled or barbecued. 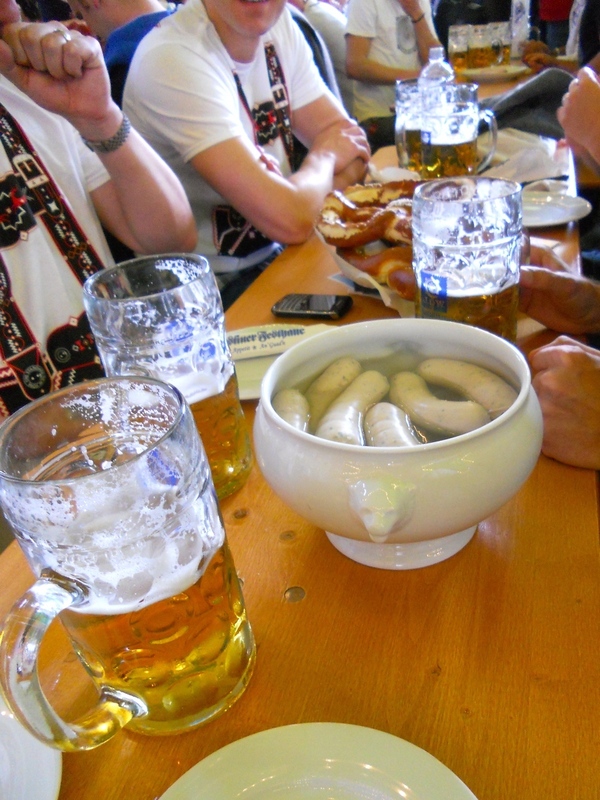 It has been a classic Oktoberfest food since it was introduced in the early twentieth century. This is a hearty stew that is made with beef liver and dumplings. 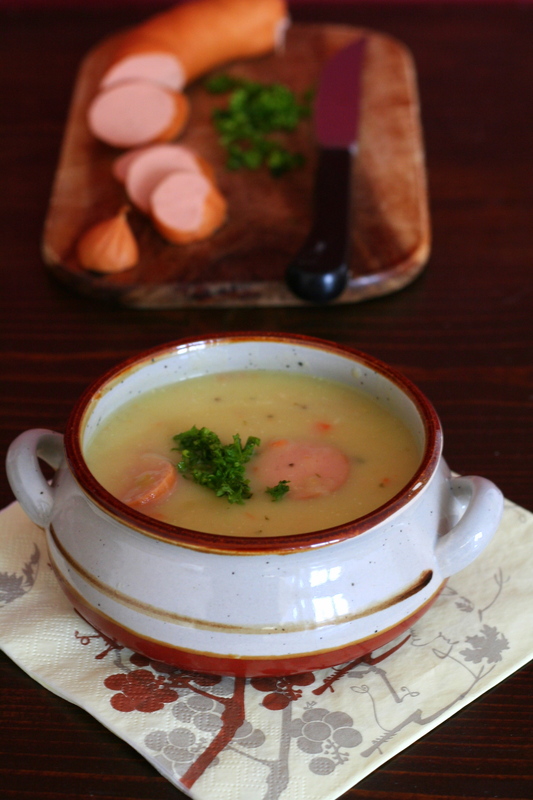 It is a simple and tasty dish that is favoured by many who want to enjoy traditional German fare during the festival. 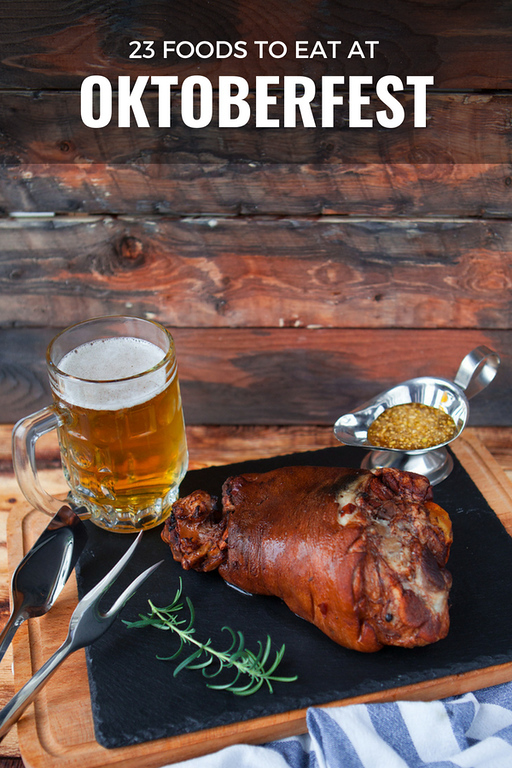 The roasted pork knuckle is one of the most popular German dishes at this time of year. It is traditionally a peasant’s dish, so as the meat isn’t of a particularly high quality. It is usually marinated for several days before cooking to ensure the result is tender and delicious. Pork chops are a dish that is common throughout Europe. But these chops are actually ripened in a salt brine and smoked before they are cooked, giving them a smoky and dry flavor. If you are attending a big Oktoberfest event, you will often find a trailer that is spit roasting an entire ox. This Oktoberfest food is a sight to see as the cook carves off slices of the delicious meat. 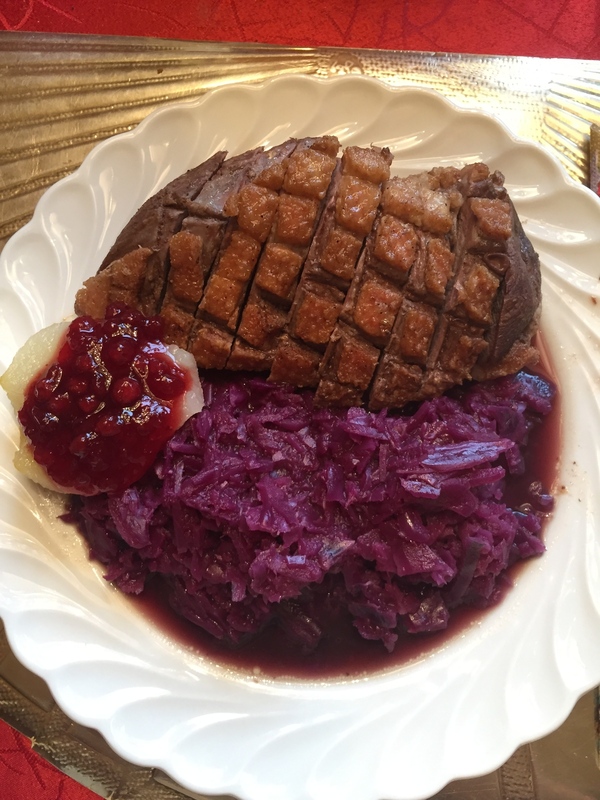 It is served with typical sides, such as sauerkraut or potatoes. The most popular and controversial Oktoberfest food to eat on the way home after a night at the celebrations. 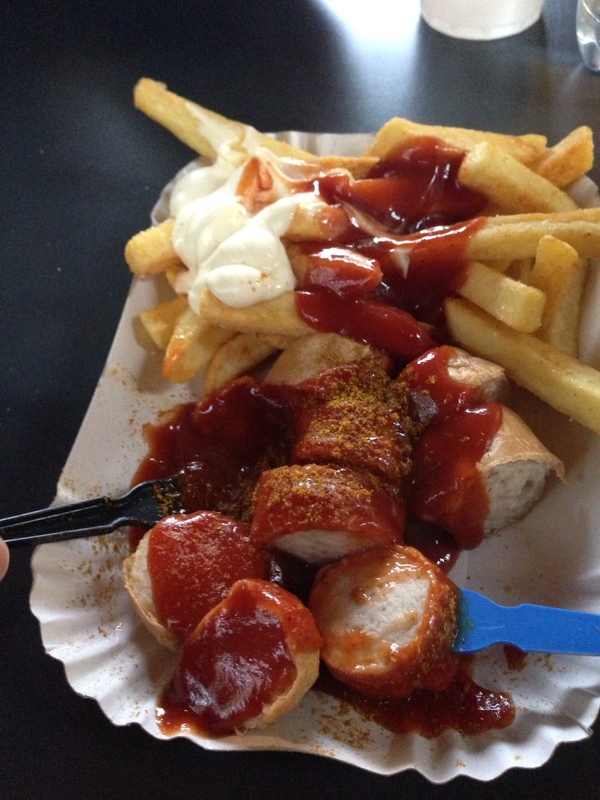 Currywurst (photo above) is a sausage that has been cooked, and often sliced, before being topped with a curry ketchup. Even if you don’t like it, it’s often served with a side of french fries which are great after a night out. These smoked sausages are another favorite during Oktoberfest. They are usually seasoned a little more than other sausages, and are most commonly seen sliced in half and served as a sandwich with mustard and a variety of other fillings. Sausage plays a huge role in terms of feeding those taking part in the celebrations. This sausage variety is made from veal, pork or beef, and is fried, with most people eating it with sauerkraut and potato salad. Meat salad anyone? This Oktoberfest food uses a sliced sausage made with white vinegar and onion. It is combined with onions, pickled vegetables and a vinegar dressing to make a tart and tasty salad. Originating in Bavaria, this white sausage usually served with mustard is made with veal and bacon. It is seasoned with a variety of spices, and then cooked in water to give it the distinctive white color. 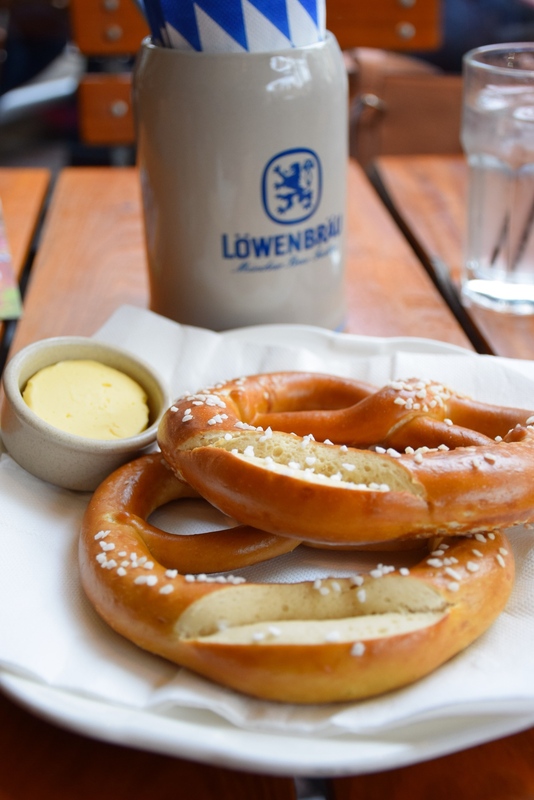 German food isn’t just meat and potatoes, and Oktoberfest food isn’t just sausage. While traditional German food does rely on meat as the centerpiece there are options for vegetarians. Some of these dishes do include egg, so you may need to ask in advance if you are not a lacto-ovo vegetarian. These fist sized pieces of crispy dough are a very popular snack during the fall. They are available in sweet and savory flavors, with the savory varieties often used as a side dish served with weisswurst to provide a more filling snack. Cabbage plays a big part in the traditional German diet. At this time of year the red cabbage is in season, so it’s almost always used as a side to all types of dishes, while also being included in salads and stews. This classic pub and bar snack is also very popular in Germany. If you are looking for just a little something to keep you going, large jars of pickled eggs in vinegar are found next to the beer taps throughout the country. Personally, I don’t understand it but to each their own. With a texture similar to a dumpling, dampfnudel is very distinctive. It is a white bread roll but has a distinctive brown crust on the bottom. 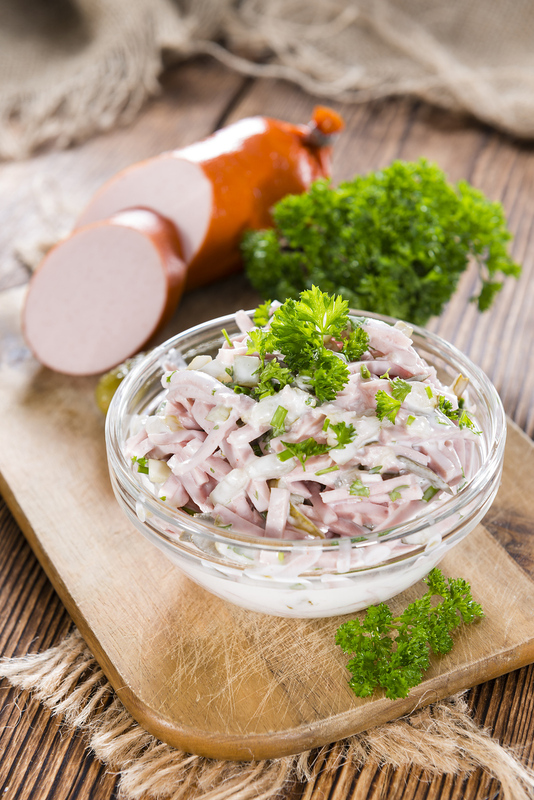 It’s common to eat this as a side to a main dish along with sauerkraut and other vegetables. If you are looking for a sweet snack to go along with your steins of beer, then these sugar roasted almonds will do the trick. These Oktoberfest snacks commonly sold by vendors during the festival. But beware they are often very sweet. 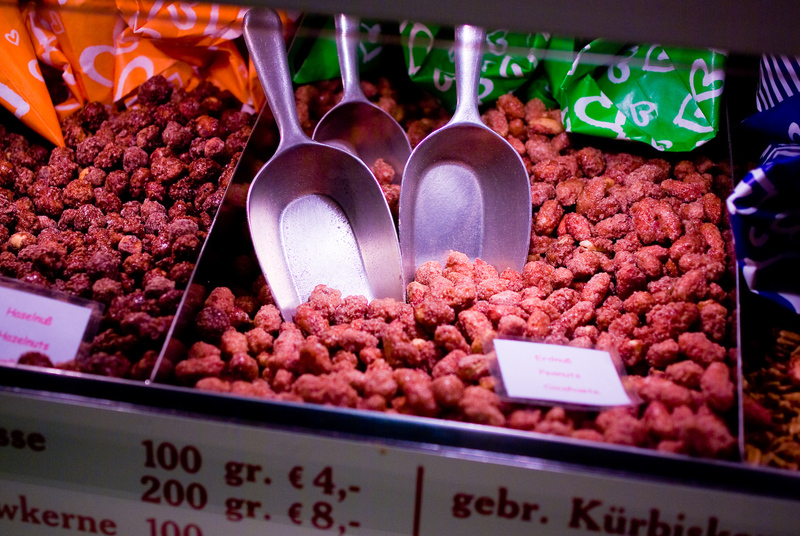 Yet it’s all too easy to eat too many of these candied nuts. Simple to make and very tasty, these pancakes are made with grated potato, flour and egg, and are then shallow fried. This Oktoberfest food is usually compared to a fritter or a latke you would see at Hannukah. There is often a selection of sauces or dips to go with the pancakes, or they can also be served as a tasty side dish to go with a main meal. These giant pretzels originate from the Munich area. As Munich is home to the world’s largest Oktoberfest event, the most common image of people celebrating is with a stein of beer in one hand and a brez’n in the other. The sour flavor of sauerkraut is something that many German people love. Cabbage is finely sliced and then fermented, no meal with meat is complete without a side of sauerkraut. These dumplings are a common side dish. Knodel are made of flour, bread or potatoes, which are then boiled to provide the wonderful doughy texture. This sandwich cake is made with two layers of vanilla sponge stuffed with cream or vanilla custard. Bienenstich is topped with a layer of caramelized almonds to make for a wonderfully indulgent dessert. Made with vanilla or lemon flavored dough, these small doughnuts are perfect if you are looking for a sweet treat to counter the flavor of the beer. They are usually sprinkled with plenty of icing sugar to give the doughnut a snowy white cap. 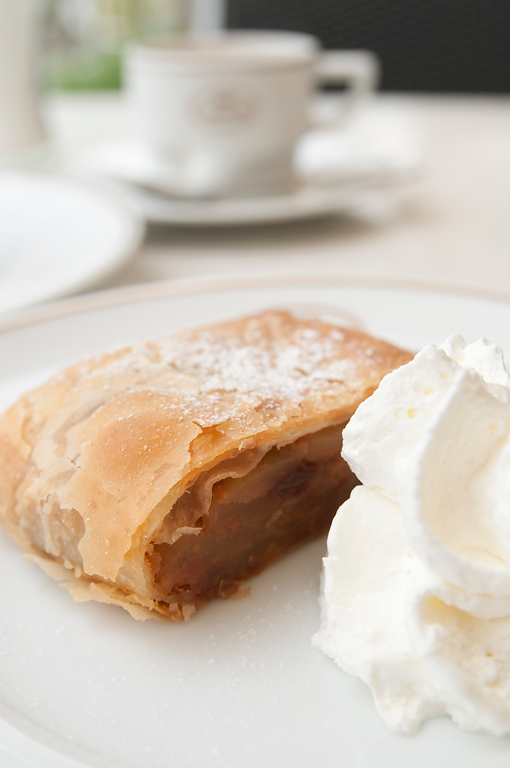 Few foods are as distinctively German as apple strudel. During the festival this sweet treat is very popular. It’s a dough pocket filled with grated cooking apples, raisin, cinnamon and sugar. 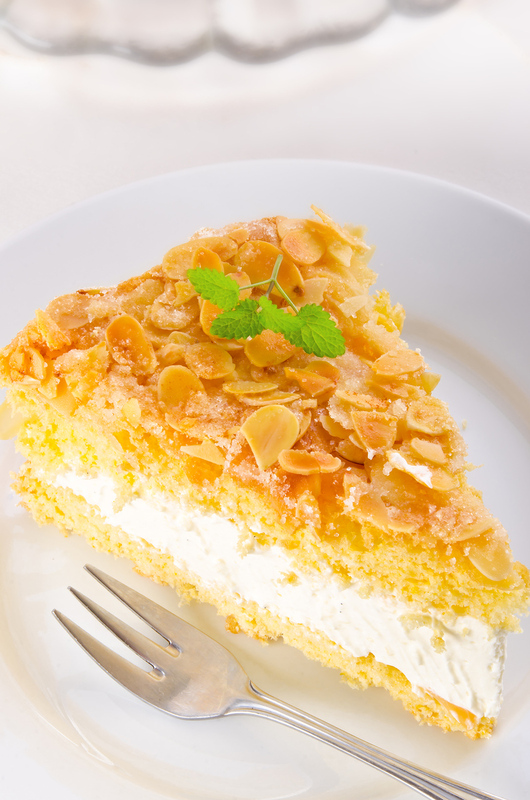 If that weren’t indulgent enough, apfelstudel is topped with custard or cream.